Over the past several years, Samsung and LG have waged a silent battle against one another. This was a battle of the big phones. The Samsung Galaxy Note reigned supreme for several generations, checking all the boxes for a power user. These must-haves included a removable battery, a massive display, expandable storage (via microSD slot), and an excellent camera. But in the same year that Samsung does away with two of these “must have” features for their most powerful smartphone, LG picks up the slack. In the LG V10 is the home for the power user. It’s not as if past generations of LG’s hero “large” phones didn’t do an OK job of acting like a hero. In the past, the staple in the LG family of phones for the “big” category was the LG G Pro. SEE: ourSamsung Galaxy Note 5 Review This massive device lineup (every iteration was large) always took at least fairly decent photos (for its time), had a removable battery, had a slot for a microSD card, and had a really nice display (again, for its time). But the LG G Pro didn’t deliver on the same scale as each of the smaller phones from LG – the LG G2, the LG G3, and most recently the LG G4. Now the line has come into is own with what would appear to be a completely out-of-left-field design and execution. 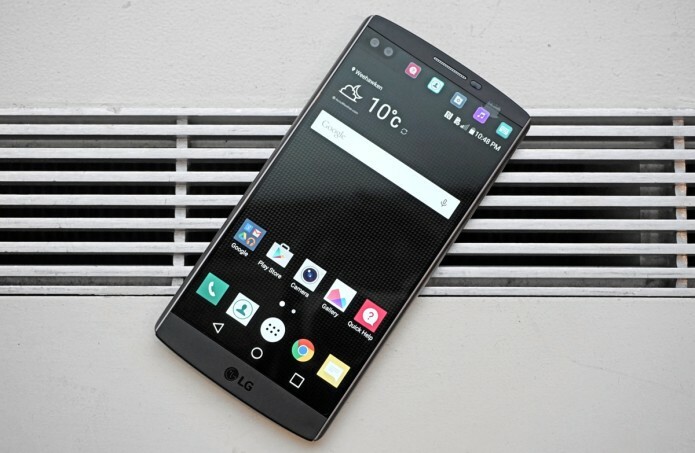 The LG V10 includes several features that either build on the success of the LG G4 or appear to be completely new to this field of battle. So what’s so great about this device that I’d even consider suggesting it could replace the Galaxy Note for a power user? This device is strange. It’s certainly not a device made for everybody. Where Samsung creates an Android that looks fantastic to most everyone, LG creates a smartphone that looks unique. Where Samsung zigs, LG zags. But LG’s decisions do not compromise the quality of the device. In the past we’ve seen LG make a device like the original LG G Flex that had a brand new, unique feature in its curved display – but didn’t have much in the way of top-quality specs. Now LG is using a strategy that might be considered more along the lines of Samsung’s own. LG hasn’t compromised on this larger smartphone, they’ve taken everything great about the LG G4 and have added to it. This smartphone is one of the last top-tier phones on the market to come with a removable, replaceable battery. This is great for a power user. As is the microSD card slot. LG knows this. They know it so well that they’ve released this device with a sort of bundle offer – new purchases of this smartphone include a 200GB microSD card as well as a second battery and a charging cradle for said battery. The LG V10 also has an IR-blaster for your TV. The Galaxy S6 has this feature, yes, but the Galaxy Note 5 does not. This LG V10 has a pair of cameras up front. With them you can take some very strange photos. One has a wide lens, the other has a slightly less-wide lens. On no other smartphone today are you able to capture a photo or a video with three cameras at once – one back, one front up close, and another up front with a wide field of view. While LG might be pushing the second display big-time with this release as a notifications deliverer and shortcut-maker, we’re all about it because it offers an opportunity to developers. Hackers, too. Modders, as well. The last time we had an opportunity like this was back in 2010 with Samsung’s Continuum. And what of Samsung’s S Pen? LG does not seem to have an equitable answer to that piece of equipment at this time. If you’re all about the S Pen and absolutely need a stylus more than anything else, Samsung’s Galaxy Note series is still the way to go. What’s this all add up to? Do you need all of these features? Of course not. But while several other major smartphone manufacturers appear to be moving in toward a smartphone design singularity, LG continues to attempt to be really, truly creative. And unlike past releases, they’re making certain you’ll be able to experience their creativity as this device launches on all three of the top carriers in the USA: Verizon, AT&T, and T-Mobile USA. NOTE: This is just one part of our review process for this device. Battery tests, photos, and a much closer look at the hardware (and software) will be delivered in the LG V10 tag portal – if they’re not up when you look, they’ll be there soon!